You are trying to lose weight and, actually, you were doing just fine until recently. You were eating better and working out, and all of the sudden what had been working for you, stopped. It doesn’t quite make sense, does it? Weight loss plateaus are frustrating because they seem to come out of nowhere. Scientists commonly refer to a weight loss plateau as adaptive thermogenesis. The cause of adaptive thermogenesis is not known, but researchers believe that it can be caused by changes in body weight, thyroid function or changes in leptin levels or sensitivity. Leptin is a hormone released from fat cells that acts on your brain and regulates appetite and body weight. Just because the scale isn’t moving, it doesn’t mean that you are making zero progress toward your fitness goals and dream body. It’s easy to think you’ve hit a plateau when you don’t see additional weight loss on the scale, but that’s not always truly the case. The scale is a poor marker of short-term progress because it doesn’t differentiate between changes in water, fat or muscle. Fluid regulation in the body is a fluid process, it is constantly changing, so one pound up or two pounds down on any given day doesn't reflect any real changes in body composition. To avoid this false plateau, and motivation killer, make sure to track your progress through several different data points, including girth -- chest, waist, arm size -- and body-fat percentage. It is possible that you can be staying the same weight, but losing inches off your waist and other areas as your body tones and tightens. 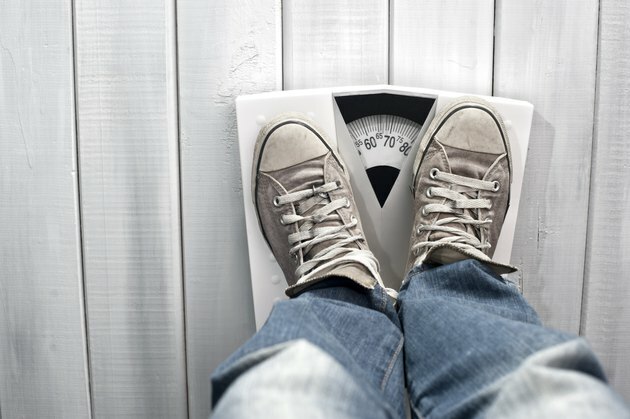 "We never use a scale by itself to measure and monitor a client’s progress," said Joe Dowdell, chief executive and founder of Peak Performance in New York City. Dowdell told me that at Peak Performance they prefer to track changes in body fat percentage via skinfold measurements or bio-electrical impedance. He’s aware that most people don’t have access to these options and said that the next best thing is using a tape measure to monitor circumference changes to the chest, waist, and arms. “A scale weight should never be used alone,” Dowdell added. Fat loss is not linear. In other words, do not expect to lose 2 pounds per week every single week until you reach your goal. Some weeks you lose less; some weeks you lose more. If you come up short one week, that doesn’t mean that you have hit a plateau -- it's just part of the natural process of weight loss. Getting adequate sleep is not your typical weight loss plateau-busting tip. But sleep is important for optimizing multiple hormones, including a number of fat-loss hormones. You can unfortunately start reaping negative effects on these fat loss hormones after just one night of poor sleep. Everyone’s sleep needs are different, and increased stress will warrant you getting more sleep. But, typically, you should shoot for seven-to-nine hours of sleep each night. "Recent research is showing that adequate sleep is important for managing a healthy body weight," said Dr. Penny Kris-Etherton, a professor of nutrition at Penn State University. She said that in addition to focusing on diet and physical activity as important components to a weight management program, new research suggests that sufficient sleep also is important for promoting weight loss, and preventing weight gain. Kris-Etherton pointed out that Healthy People 2020, a program of the U.S. Department of Health and Human Services, recommends at least 7 hours of good quality sleep per day for good health. According to the CDC which sites data from the National Health Interview Survey, nearly 30% of adults reported an average of less than six hours of sleep per day in 2005-2007. So, if you have reached a weight loss plateau, it is important to pay attention to your sleep frequency and duration along with good nutrition and physical activity practices. Regardless of how solid they are, your diet and exercise plans won’t work if you aren’t sticking to them. You’ve made a commitment to yourself, and now is time to come through with it. Plan and track your diet and your workout plan. Map out your meals, snacks and workout nutrition for the week -- a grid or spreadsheet works well for this. As you eat your planned meal or snack, put a big X over it on your menu map. If you skip a meal or eat something not on your plan, circle the meal. You can also use free online eating tracker tools like LIVESTRONG.COM's free MyPlate calorie tracker app that make it easy and foolproof to plan and track your meals and calories. The MyPlate app will calculate and tell you how many calories you need per day to reach your fitness goals. You can also see the total number of calories, fat, carbs and protein in every food and meal you track. At the end of the week, count the number of meals that you ate according to your plan, divide that by the total number of meals, snacks, and workout shakes you had planned, and multiply by 100. If you hit 90 percent or more, nice work. If you didn't hit at least 90 percent, then your efforts should be dedicated to working on your dietary plan rather than troubleshooting physiological roadblocks to your weight loss. Now that you know the reasons why your plan is not working as well as it was in the beginning, make the necessary changes to reach your goals. Good luck! If you're adhering to your diet plan and getting adequate sleep, and your progress has still been at a standstill for a couple weeks, now is the time to make some dietary tweaks. Remove the carbohydrates in your diet from the top of the list down. This removes the faster acting, carbohydrate-dense foods first and leaves the lower carbohydrate, lower calorie, and higher volume carbohydrates until the end. While I have included added sugars and refined grains for completeness, note that they should not be in your diet -- except for the occasional (and I mean occasional) splurge. Why Am I Losing Inches, Not Pounds, With Diet and Exercise?